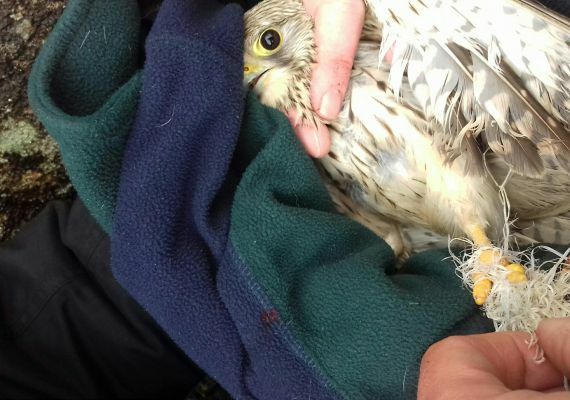 Kestrel tangled in baling twine rescued by Woodrow field workers. Woodrow ornithologists Mike Trewby and Hugh Delaney rescue a Kestrel who had a ball of baling twine twisted around her foot and which had tangled into a hawthorn bush. ‘‘It was a strange experience to say the least, we had passed the spot she was at on the way up to the V.P,(vantage point) [but wouldn’t have spotted her as she only really visible in the reverse direction]., it was here we actually saw the only Kestrel of the day flying over - maybe her mate keeping her company, who knows, and it was just pure luck that we chanced on her on way back down from V.P - talk about being in the right place at the right time. She was certainly doomed had she not being cut free as not only was she well snagged but the foot was starting to swell up from the tight constriction of plastic wrapped at its base. We should have taken shots of her tethered to the bush just to illustrate how lethal an innocuous-looking small ball of plastic can potentially be, but such was the panic we just wanted to get her free. She was a feisty thing that left a temporary reminder of her talons on Hugh’s fingers! Another example of how plastic can harm wildlife - it’s not just in the oceans!